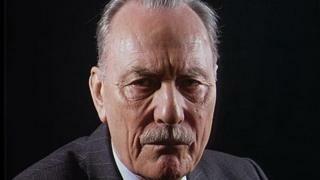 The BBC has defended a decision to air Enoch Powell's 1968 "Rivers of Blood" speech on Radio 4. The Archive on 4 programme, presented by BBC media editor Amol Rajan, will on Saturday broadcast the right-wing MP's anti-immigration speech - voiced by an actor - in full, for the first time. The decision to do so was criticised as an "incitement to racial hatred". The BBC said there would be "rigorous journalistic analysis" and the show was not endorsing controversial views. Marking 50 years since the speech, Archive on 4 plans to reflect its enduring influence and significance. The full text will be read by actor Ian McDiarmid, who played Powell on stage in the play What Shadows but is probably best known for playing Emperor Palpatine in the Star Wars films. But Lord Adonis has called for the broadcast on Saturday to be cancelled, and has written to the regulator Ofcom. "What is happening to our public service broadcaster?" the Labour peer wrote on Twitter. He said the speech was the "worst incitement to racial violence by a public figure in modern Britain". "Obviously this matter will be raised in parliament" should the broadcast go ahead, he wrote to Ofcom. Earlier this week, Remain supporter Lord Adonis wrote to the BBC to make a formal complaint about its Brexit coverage, describing it as "fundamentally corrupted". A number of journalists have also criticised the Rivers of Blood broadcast, suggesting it is evidence of racism being "normalised". One contributor to the programme, Dr Shirin Hirsch from the University of Wolverhampton, has since tweeted that she "made a mistake" in being interviewed for it and was "sick with worry since seeing the way this is being presented". "We can study racists without platforming and amplifying the racist things they say," said another Twitter user. The BBC said: "This is a rigorous journalistic analysis of a historical political speech. It's not an endorsement of the controversial views and people should wait to hear the programme before they judge it." Ofcom said its position as a post-broadcast regulator meant it would not "check or approve any broadcaster's editorial content before transmission".